NEW YORK, NEW YORK – November 21, 2016 – GameChange Solar announced that KPCC News published an article “A new approach to energy: Using old landfill sites to generate solar power”, which showcased the GameChange Solar Pour-In-Place™ Ballasted Ground System racking with round tubs. Sprinkled throughout Southern California are large pockets of toxic land, vacant 100-plus-acre warts of unusable space — most of it old landfills. Now there’s a movement to rehabilitate those sites by using them for alternative energy projects, transforming huge hills of debris into generators of wind, methane gas and solar energy. These efforts help cut greenhouse gas emissions, create jobs, make a little cash for local communities and in some cases help clean up the site itself. Milliken landfill is one of those sites. Closed since 1999, it rises like a small mountain near Ontario International Airport, with one of the best views in the area. 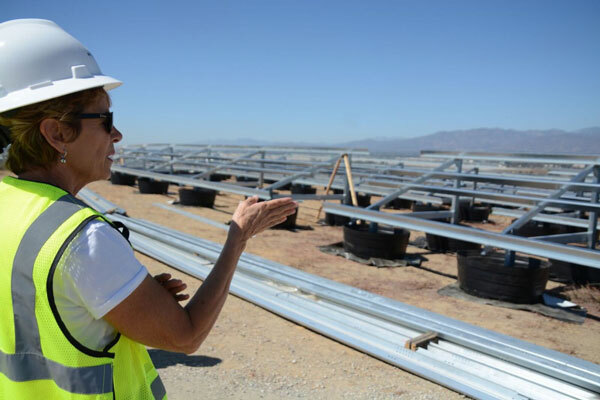 On the flat stretch of land at the top of the landfill, Mary Esper supervises the installation of a large solar project by the Brea-based PV Navigator. It's expected to start generating electricity by the end of this year. Two dozen men in hardhats and yellow vests brace themselves as they set up hundreds of metal frames that will hold almost 10,000 solar panels. The completed frames sit in large black plastic tubs that resemble tall, round plastic wading pools. They're evidence of how tricky it is to build up here. 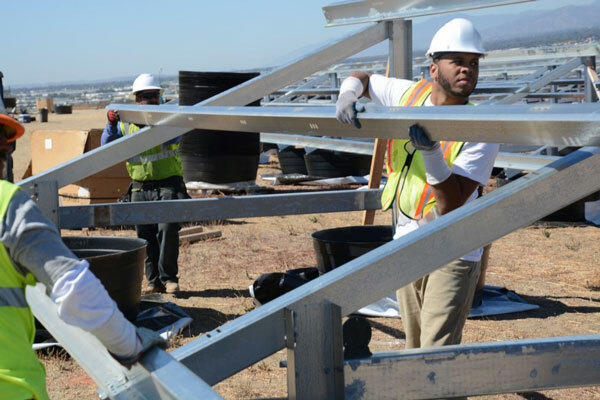 Because this is a closed landfill, construction crews aren’t allowed to drill into it for support, so they pour 4,500 pounds of concrete into each plastic tub – a little more than one cubic yard of concrete per tub — to form the solid feet for the array of solar panels. This site is just one of about 30 large toxic dumps littering Southern California's urban landscape. At his office in Brea, PV Navigator President Ian Webster points out all of the landfill sites in Los Angeles, Riverside and Orange counties on a giant wall map. They ring the dense L.A. area like a chunky necklace. "Historically, these landfills — they were on the edge of the boundaries between cities," Webster explains. "As the Los Angeles basin has infilled [over] time, these landfills are now completely surrounded by homes." "It's hard for a solar developer to find low-cost land," Webster says. "The landfill sites are the highest opportunity for that." Most solar projects need large spaces, so in Southern California they tend to be sited in the desert, and the power has to be transmitted long distances to reach consumers. Since many of the old landfills and brownfields in the area exceed 100 acres, they could be a large source of nearby power, he says. UC Davis bioscience professor Rebecca Hernandez is a fan of these types of projects. "We are interested in techno-ecological synergies," says Hernandez, who researches the possible uses for California's toxic sites. "That's a term we use to describe mutually beneficial relationships between technological and ecological systems." In addition to solar production, some sites harness wind and landfill gasses like methane to run energy turbines, she says. And at a few of them, Hernandez says, that power has been used to help clean up the toxic areas and restore them. "You're using degraded land, you're producing renewable energy and you're bringing back some functioning to that parcel of land too," she says. "It's like a win-win-win scenario." David Doublet doesn’t have quite the same lofty goals. As a San Bernardino County public works engineer, Doublet appreciates the contribution to lowering greenhouse gas emissions, but he's pleased the land is being used at all. He points out that the county gets monthly rent from solar operators, along with a small percentage of the money from solar energy generation. "It's nominal," Doublet says, "but it's something we were not getting yesterday, something we were not getting in the 15 years [the landfill's] been closed." The modest financial gain for municipalities and solar operators is one of the reasons this trend is taking off. Gazing at his wall map, PV Navigator's Webster points to the Los Angeles coastline and says there’s opportunity to expand to other types of abandoned sites. "Along the coast here, we're starting to open up a conversation with various oil companies about former tank farms that could be repurposed too," Webster says.